On the OSU campus the group was caught red-handed in February attempting to finance the campaigns two OSU student senate candidates to the tune of $6000. This huge sum dwarfs the campaign war chests of municipal government officeholders in many small Ohio towns. Leaked documents and excellent reporting the by OSU student newspaper put a quick end to that illegal scheme. 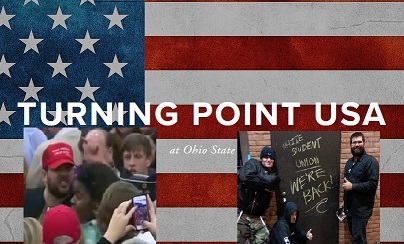 Turning Point, which boasts chapters on the campuses of at least of at least 5 Ohio colleges that could be identified by the Mockingbird, launched it's OSU offensive as part of it's nationwide drive to develop leadership. This is not their only method of leadership development and the other is insidious as opposed to illegal. Turning Point, along with it's fellow traveler campus conservative groups, the Daily Caller and the College Fix, send their leaders to a program called the “Leadership Institute,” which appears to be a front for the parent foundations of all three in a dizzying non-profit corporate shell game. The Leadership Institute also trains leaders of neo-nazi groups. The most notorious of these alumni is Mathew Heimbach. Heimbach, who leads the neo-nazi Traditionalist Workers Party from his decaying compound next to a Walmart in Southern Indiana, is famous for his open racist attack on a young black woman at a Lousiville Trump rally while screaming “Leftist Scum Get Out!” Heimbach, who has been photographed seig-heiling at Klan events multiple times in Indiana and Kentucky, encourages all his members to attend Leadership Insitute trainings, and the Leadership Institute admittedly has no vetting procedure to keep this from happening. Thus Turning Point is happy to train Heimbach's stormtroopers, all the while funneling money into campus politics illegally. The group also operates a website called the Professor Watchlist, where it keeps a small but growing list of “leftist” professors on varying college campuses. This list dovetails with other similar attacks by their cohorts at the College Fix and Daily Caller. Eventually it may serve as a targeting list for violence by the neo-nazis like Heimbach they openly recruit and train. A local direct action human rights group, Anti-Racist Action has called for a demonstration outside the Crown Plaza Hotel on Saturday. Calls for comment to Crown Plaza's management have been met with extended hold times and abrupt hang ups. Aparently they do not wish to speak to the press about providing a training camp for the new American Sturmarbeitlung.